Developer Hamish Marshall’s project, called Pacific Courtyards, was approved in 2008, but never constructed due to the down economy. Because of several proposed changes, such as ground level parking garage, the project requires additional approvals. The project site sets between Osos and Morro streets across from Grace Church. 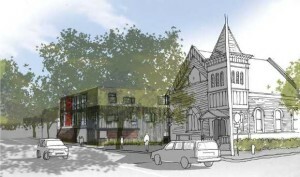 Marshall has changed the proposed architecture from a neo-Victorian design to a flat-roofed contemporary. The city’s Cultural Heritage Committee voiced objections to the design because they say it is inconsistent with the city’s historic preservation guidelines. The city’s Architectural Review Commission will review the project on Dec. 16. The “contemporary” design pictured does not fit into the space across from Mitchel Park. I lived on this property 40 years ago, such a fine location. “Cultural Heritage Committee?” Huh? Exactly what “history” are they trying to “preserve” by putting lipstick on a pig? Not matter how you try to disguise it, SLO will always look like what it has become: The northernmost boundary of Los Angeles sprawl. Where people from L.A. go to pretend their not in L.A. anymore. WestPac and Mr. Marshall, have certainly changed the “face” many commercial properties in San Luis Obispo.